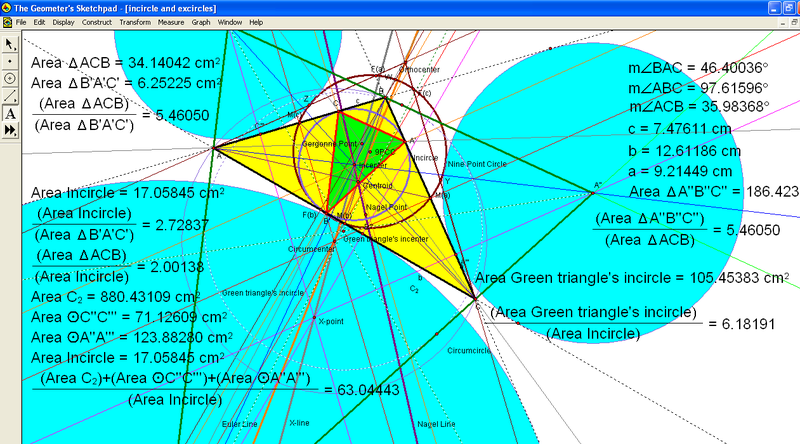 I just spent a couple of hours playing with triangles, their centers, and related things, using Geometer’s Sketchpad. Much of what I found was already known, but some of the things I found may not be. It will take more research to sort out which is which. This is where I started. My original triangle, ABC, has heavy black sides and a yellow interior. The sides of ΔABC are extended as black dashed lines. I constructed ΔABC’s three angle bisectors to find its incenter, then constructed perpendicular lines to each side of the triangle from the incenter to find the three “touchpoints,” called A’, B’, and C’, allowing me to construct the incircle of my starting triangle. I also wanted the three excircles, and they are centered at A”, B”, and C” — the three excenters of triangle ABC. 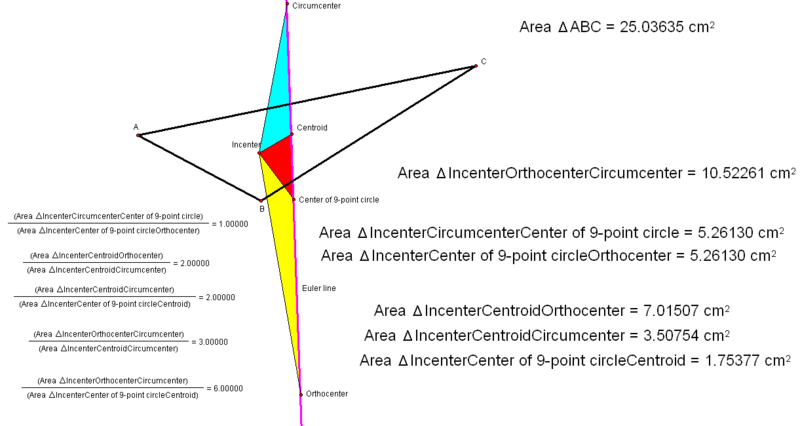 These points are found by bisecting all exterior angles of the original triangle, and then looking for the three point of concurrency among themselves, and the three interior angle bisectors previously used to locate the incenter. 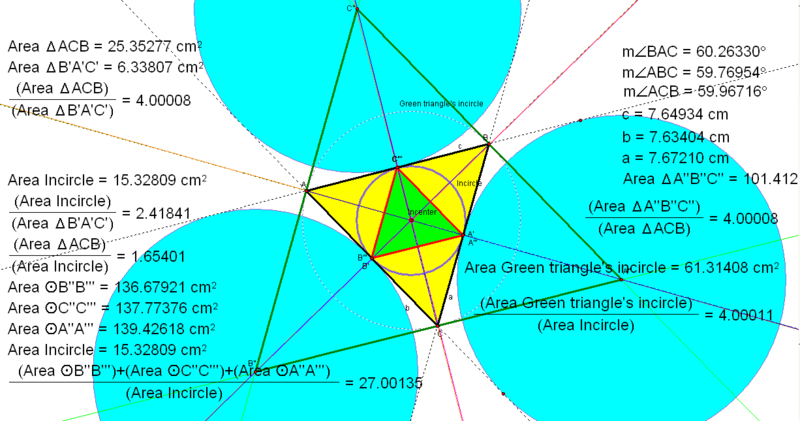 The heavy green, large triangle is the triangle which connects the three excenters, and probably has an established name, but I couldn’t find it — so I’ll just be calling it the “green triangle.” It is not to be confused with the small triangle in the diagram’s center, which has red sides and a green interior. This small triangle is simply formed by connecting the touchpoints A’, B’, and C’, and has several names already: the Gergonne triangle, the contact triangle, and the intouch triangle of ΔABC. I set this up in such a way that I could move points A, B, and C around, and watch what happened to angle measures, segment lengths, areas, and area ratios. The picture above shows what happens near regularity, with all three interior angles very close to 60°. This is how I learned that certain area ratios are at a minimum when the triangle is equilateral — as you’ll see, they are all larger in subsequent pictures. At regularity, the green triangle has an area exactly four times that of the original triangle, which, in turn, has an area four times larger than the Gergonne triangle — and, away from regularity, these two area ratios remain equal to each other. 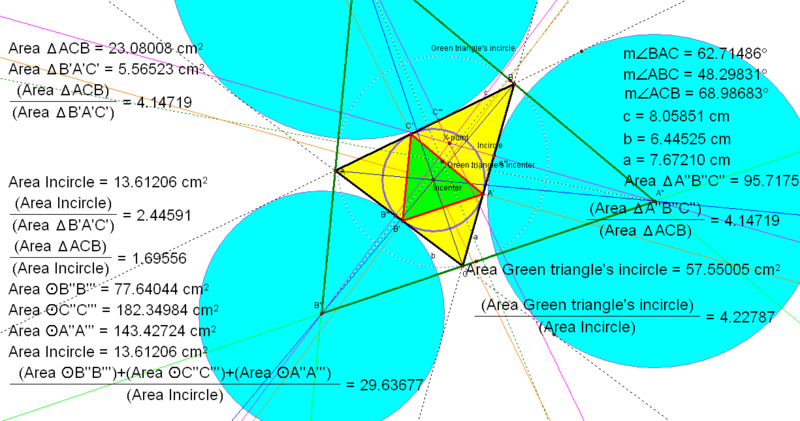 I also found that the green triangle’s incircle’s area is, at minimum, four times that of the original triangle’s incircle — but if you deviate from regularity even slightly, it can be seen that this “just above four” is not equal to the “just above four” area ratios described at the end of the last paragraph. 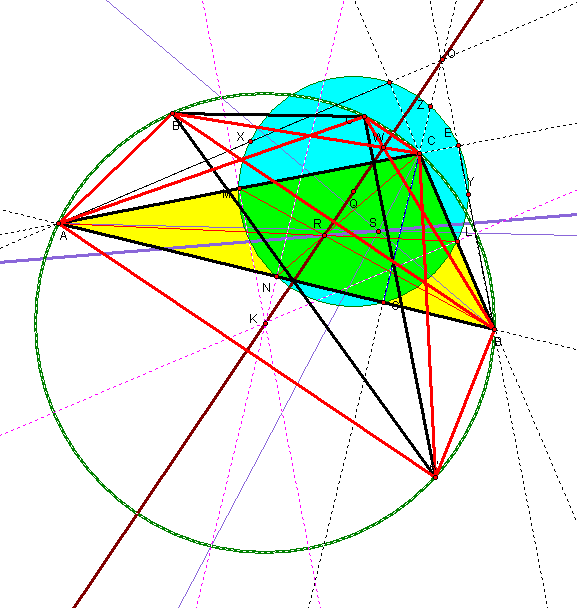 I also tried adding the areas of all three excircles, then dividing this sum by the area of the incircle. At regularity, this ratio is 27, so each excircle would have exactly nine times the area of an incircle for an equilateral triangle. From that, it follows that an equilateral triangle’s excircle’s radius is three times that of the radius of the incircle. These numbers are minimums; the get bigger if the triangle deviates from regularity in any way. This second picture shows what happens when regularity is abandoned. I noticed that the green triangle’s incenter, the original triangle’s incenter, and a third point of concurrency I am calling the “x-point” (because I suspect it already has a name, but I don’t know what that name is) appeared as if they might be collinear — but might not be. I checked, and they are non-collinear. I then decided to investigate this x-point further. The x-point is the one point of concurrency of the three lines, one for each excircle, which contain that excircle’s center, as well as the point of tangency between that excircle and the original triangle. To investigate this x-point further, I started locating other triangle centers, and also continued moving A, B, and C around. The picture above shows the Gergonne point added to the diagram. The Gergonne point is a point of concurrency of three lines — each being a line containing a triangle’s vertex, and the touchpoint opposite that vertex. As you can see, these points still refused to line up. I therefore decided to go all-out, and add many more triangle centers. 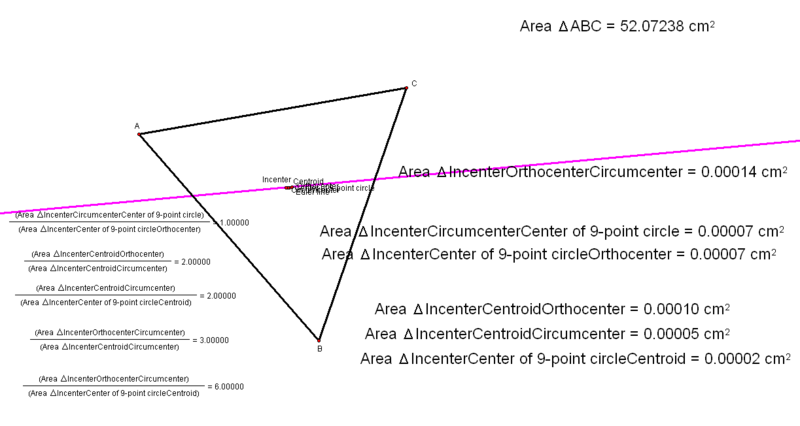 In this last picture, I’ve added the circumcenter (point of concurrence of the triangle’s sides’ three perpendicular bisectors), centroid (point of concurrence of the three medians), orthocenter (point of concurrence of the lines containing the triangle’s three altitudes), and several other things for which you can easily find definitions on Wikipedia — such as the 9-point circle, its center, the Nagel point, the Nagel line, and the Euler line. 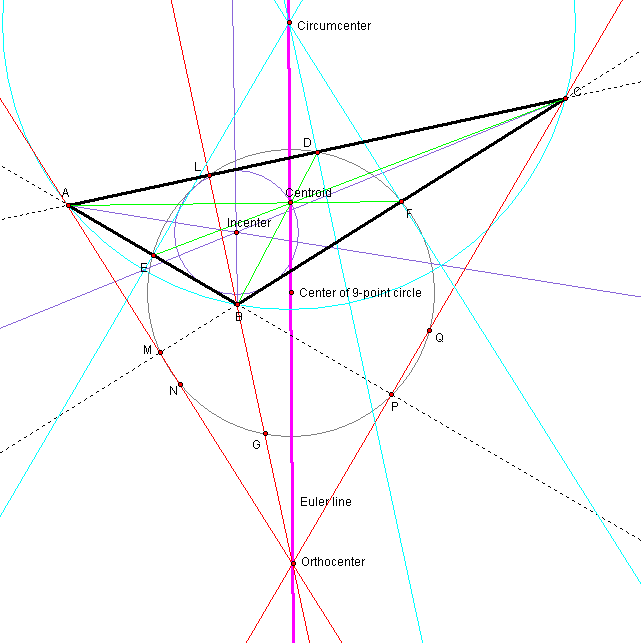 As you can see, the Euler Line (shown as a heavy orange line) passes through the orthocenter, the center of the nine-point circle, the centroid, and the circumcenter. It does not, however, contain the incenter. What does? The Nagel line (shown in heavy purple), for one thing, which also holds the Nagel point, as well as the centroid, where it intersects the Euler line. If anyone who reads this knows more about the x-point or x-line, such as their already-existing names (assuming they’ve been discovered before), please leave this information in a comment here. I Have Found a (Possibly) “New” Point On the Euler Line — But I Also Need Help Nailing Down Its Properties and Definition. In this diagram, the original triangle is ABC, and is yellow. The brown line, u, is that triangle’s Euler Line, which contains the triangle’s orthocenter (O), circumcenter (K), centroid (R), and nine-point circle center (circle shown, centered at Q). The point I have found on the Euler Line is at W.
To find W, do the following: reflect triangle ABC over the Euler Line to form triangle A’B’C’ (shown uncolored, and with thick black edges). 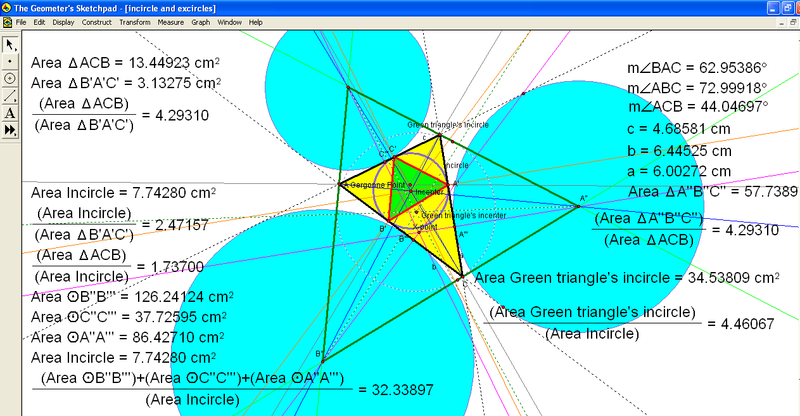 Both triangles, ABC and A’B’C’, have the same circumcircle (shown in green, with uncolored interior). Because of this, a cyclic hexagon may be formed by joining A, A’, B, B’, C, and C’ with segments, linking each in turn as one encounters them on a mental trip once around this circumcircle (the order in which these six points are encountered can change as A, B, and/or C are moved). A hexagon has 9 diagonals. Of these, six are the sides of ABC and A’B’C’. Here, they are shown in black, and the other three diagonals are shown in red. These red diagonals are not necessarily concurrent, but any two of them do have to intersect, and those three intersections are points T, V, and W. At least one of those points — W, in this case — must be on the Euler Line. To get the other two points on the Euler Line, make the triangle approach regularity. As this is done, K, R, Q, O, and W converge, making the definition of the Euler Line itself problematical. Point W needs a better definition. Which two of the three hexagon-diagonals which aren’t sides of the original triangle, nor its reflection, intersect on the Euler Line? I haven’t figured that out yet. Also, a formal proof for most of what I have described here is beyond my present abilities. Why, then, do I believe the statements to be true? Answer: the evidence provided by experiment. This image is a screenshot from Geometer’s Sketchpad — but I don’t know how to post an animation of what happens when A, B, or C are moved. However, I can move them myself, with the program in operation, and observe how everything changes (this is one of the best features of Sketchpad, in my opinion). As these points are moved around, pairs of the heavy red segments (hexagon sides, and three of its diagonals) sometimes “flip” — a side becomes a diagonal, and that diagonal becomes a side. At that point, T, V, and W must be relabeled. Also, some positions of A, B, and C make the area of triangle TVW approaches zero — it collapses to a point on the Euler Line. Odd things also happen if you make triangle ABC isosceles, because the Euler Line for an isosceles triangle is the perpendicular bisector of the base, which causes triangle A’B’C’, upon reflection of triangle ABC across the Euler Line, to map onto triangle ABC. When this happens, the hexagon becomes a single triangle, making its diagonals vanish — and point W goes and “hides” at the vertex opposite the base of isosceles triangle ABC, by which I mean W approaches that vertex as scalene triangles get closer to being isosceles. The Nagel Line (that line which contains the incenter, S, and the centroid, R, where it intersects the Euler Line) has been added, and is shown in purple. As you can see, point W is not on the Nagel Line. With the triangle being obtuse, the earlier all-red convex hexagon is now gone, because two of its sides are black, due to them being sides of triangles ABC and A’B’C’. Point W persists, though, still on the Euler Line, and located in the area between the vertices of these two triangles’ obtuse angles. My hope, in pointing this last fact out, is that it might help define which two hexagon-diagonals’ intersection defines the location of W. It might also be possible to use this to distinguish between the first diagram’s points T, V, and W, for, in the first diagram, W, which is what I am calling the only one of these three points to be on the Euler Line, was the one nearest the largest interior angle of triangle ABC — and the same is also true of triangle A’B’C’, as well. However, the matter of picking W out of the “T, V, and W” set of points may have nothing to do with angle size — it could be, instead, a matter of proximity of A, B, and C, as well as their reflections, to the Euler Line itself. In other words, “Which one is W?” might be answerable simply by examination of which member of the “T, V, and W” set is closest to the member of the set “A, B, and C,” as well as “A’, B’, and C’,” which is, itself, closest to the Euler Line. This matter needs further investigation, with which I would welcome help from anyone. Also: there are two easier-to-define points on the Euler Line, unlabeled in the diagrams above, which are the two points where triangles ABC and A’B’C’ intersect. The existence of these points on the Euler Line is simply a consequence of the fact that A’B’C’ was formed by reflecting the original triangle over the Euler Line. These two points could use special names, but nothing is immediately springing to my mind which would be appropriate. Another point on the Euler Line, also a consequence of reflection, appears as the midpoint of segment TV in the first diagram, and the midpoint of BB’ in the second — segments which appear analogous. This also seems to apply to the midpoints of AA’ and CC’. At this stage of the discovery process, though, appearances can be misleading. I want to work out a better definition for this point, W, on the Euler Line, perhaps as an as-yet-undiscovered member of the large collection of triangle centers. I also need to know if it has already been found. If you have information pertinent either of these things, or to any part of this post, please leave it here, in a comment. Several days recently swirled down the drain in a depression-spiral. Needing a way out, I spent my Saturday morning playing with triangles, after first getting plenty of sleep. It worked. This technique, however, probably would not transfer to those who are not geometry obsessives. Perhaps any favorite activity would work? I leave that to others to explore. The original triangle is ABC, and is in bold black. The bold blue line is its Euler Line, and contains the orthocenter (M), circumcenter (G), nine-point center (K), and centroid (point W). It does not, however, contain the incenter (S). It struck me as odd that the incenter would be different in this way, so I investigated it further. It is the point of concurrence of the three angle bisectors of a triangle. On a lark, I constructed the midsegments of triangle ABC, forming a new, smaller triangle, shown in red. When I then found the incenter of this smaller triangle (Z), it appeared to be collinear with S and W. I checked; it was, and this line is shown in bold yellow. Moreover, the process could be continued with even smaller midsegment-triangle incenters, and they were also on this yellow line. I wondered if I had discovered something new, and started to check. It didn’t take long to find out that Nagel had beaten me to it. The Nagel line is the official name of this yellow line I stumbled upon, and here is my source: http://mathworld.wolfram.com/NagelLine.html — but, as far as I know, I did discover that these midsegment-derived points also lie on the Nagel line. Someone else may have known this before, of coruse. I don’t know, and it doesn’t matter to me, for I had my fun morning playing with triangles, and now feel better than I have in days.